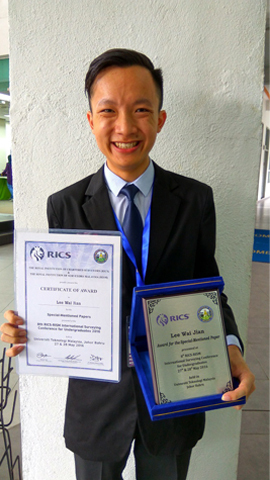 Final year Quantity Surveying student Lee Wai Jian received the “Award for the Special-Mentioned Paper” for his paper titled “The Impact of Implementation of Goods and Services Tax (GST) in the Malaysian Construction Industry” at the 8th RICS-RISM International Surveying Conference For Undergraduate 2016 held on 27 and 28 May 2016 at Universiti Teknologi Malaysia (UTM). “Construction practitioners are facing the issues of classifying input and output tax to claim GST rebates and of distinguishing taxable and non-taxable contracts to claim exemption,” said Lee, who was supervised by Dr Chia Fah Choy. The RICS-RISM International Surveying Conference For Undergraduate is an annual conference organised jointly by the Royal Institution of Chartered Surveyors (RICS) and the Royal Institution of Surveyors Malaysia (RISM) together with participating universities who host the event on a rotating basis. The conference acts as a platform for undergraduate students pursuing quantity surveying in universities across Asia-Pacific to learn, exchange,and share their undergraduate research papers. 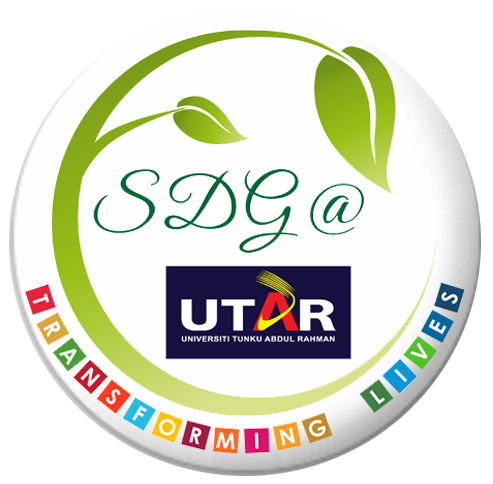 Besides UTAR, the other participating universities were Universiti Malaya (UM), Universiti Teknologi Malaysia, Universiti Sains Malaysia (USM), Universiti Teknologi Mara (UiTM), Taylor’s University, INTI International University, International Islamic University Malaysia, and Assumption University, Thailand.